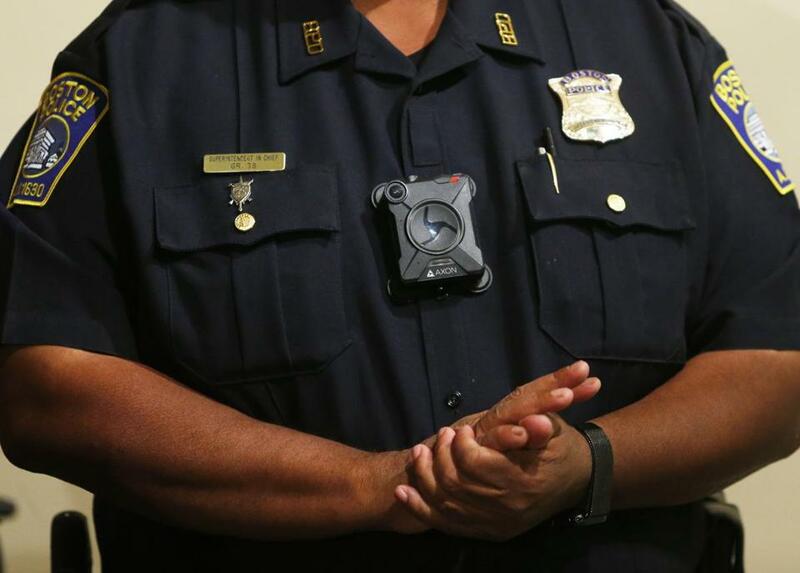 All Boston police officers could be wearing body cameras by the end of the year. Mayor Martin J. Walsh committed Monday, in his strongest language yet, to funding police body cameras in Boston. “This [dedicated funding] will guarantee that the police department has the tools they need for implementation once this study is complete in June,” the mayor said through a spokesperson. Pending final approval, Boston police officials said Monday that a final police body camera program could be implemented across the department by the end of the calendar year. The commitment came after Police Commissioner William B. Evans signaled growing support for the program within the police department, saying the last hold-up to the implementation of the program is funding. It could cost $5 to $7 million to outfit the department with cameras and implement the program, he said. The one-year pilot program found that 12 fewer complaints were filed against officers equipped with the body cameras over the one-year period. In a time of deteriorating relations between police and communities across the country, more and more departments have begun using body cameras to record police and civilian interactions, though they have sometimes come with controversy: Police officers say the cameras limit their discretion in making arrests, and change police interactions with civilians, while civilians say they help to ensure accurate police accounts amid concerns of excessive force. The proposal for police cameras became a campaign issue in last year’s mayoral election, with Walsh questioning whether they would be beneficial in the city. The final report on the pilot program, conducted between 2016 and 2017, is due in June, though a preliminary review found that officers who wore body cameras were less likely to have complaints of wrongdoing filed against them. The researchers, from Northeastern University, said the review yielded significant findings worth further examination, but they also noted that the low number of officers with cameras in the study, and the relatively low number of complaints against Boston police compared with other departments in general, could make it difficult to say whether body cameras would affect police and community relations in Boston. In the study, 100 cameras were placed on patrol officers and gang unit officers across the city for a year. Researchers analyzed the complaints filed against them and their reports of use of force against a similar group of officers who did not wear cameras. Evans said that officers who’d been reluctant to wear the cameras later said they were useful and helped to preserve evidence for both parties. “I think the district attorney liked them, I think defense attorneys liked them,” Evans said. City Council president Andrea Campbell, who has pushed for body cameras in Boston and requested Monday’s hearing, said it is only a matter of time and called for the city to study the use of other technology to help monitor and improve community and police relations. An earlier version of this story mistakenly stated that Walsh committed for the first time on March 12 to funding the body camera program, but he previously said he would set aside funding for the program during a Feb. 2 interview on WGBH’s Boston Public Radio.